The Final Testament: The Quran revealed to mankind from the Creator Lord encourages to inquire into the mysteries of the creation and to seek the Creator's splendor in the creation. Unto God belongeth the Sovereignty of the heavens and the earth. God has power over all things. Explanation: A massive star ends life as a supernova, blasting its outer layers back to interstellar space. The spectacular death explosion is initiated by the collapse of what has become an impossibly dense stellar core. 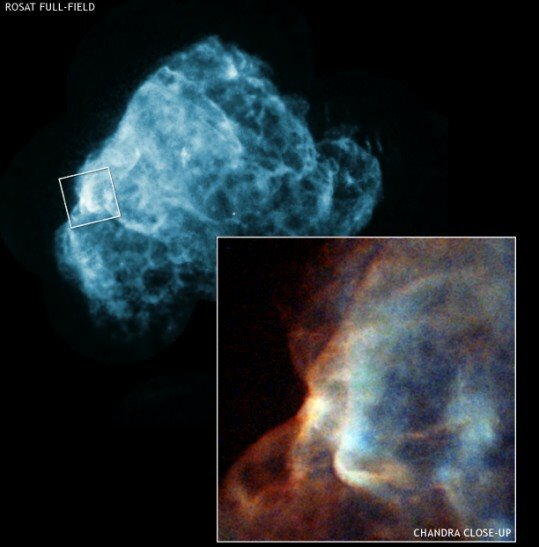 Pictured is the expanding supernova remnant Puppis A - one of the brightest sources in the x-ray sky. Now seen to be about 10 light-years in diameter, light from the initial stellar explosion first reached Earth a few thousand years ago. Recorded by the Chandra Observatory's x-ray cameras, the inset view shows striking details of the strong shock wave disrupting an interstellar cloud as the shock sweeps through preexisting material. The larger field ROSAT image also captures a pinpoint source of x-rays near the remnant's center. The source is a young neutron star, the remnant of the collapsed stellar core kicked out by the explosion and moving away at about 1,000 kilometers per second. Credit: Chandra: NASA / CXC / GSFC, U.Hwang et al. ; ROSAT: NASA/GSFC/S.Snowden et al.